A non-standard pay item is a pay item number that may have different descriptions and/or units of measure from one project to the next (or even within the same project). Some states call these items special pay items. 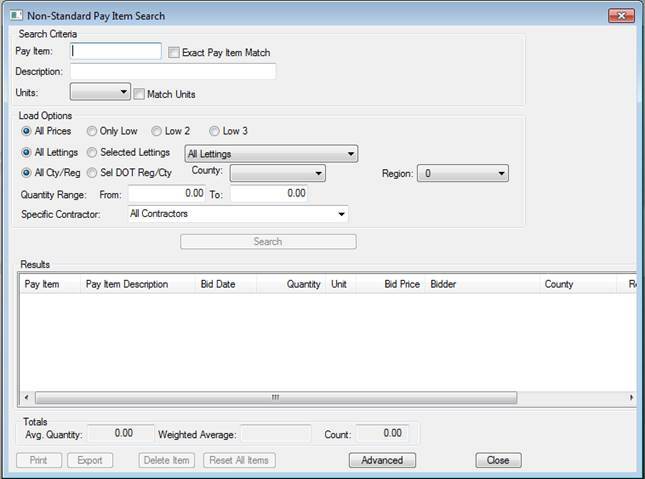 bidTABS Professional handles non-standard pay items differently than standard pay items, and there is a separate database for these items. This option is only applicable for states that utilize non-standard pay items. To search for non-standard pay items, select “Reports: Non-Standard Search” from the main menu. This option allows you to search and generate averages for non-standard items. You can enter either a full or partial pay item number or pay item description along with any other options you may want. The results of the search will be listed in the results window at the bottom of the screen. Note that the search results will include both standard and/or non-standard items that meet the search criteria you entered at the top of the screen. 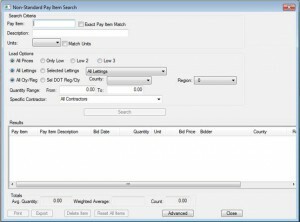 You can also search for multiple words within a pay item description by entering two periods between words. For example, to search the database for the words “concrete” and “pipe” anywhere within the pay item description, you would enter “concrete..pipe” in the pay item description field. After you have entered the search criteria, press the “SEARCH” button in the middle of the screen, and the results will be displayed on the results window at the bottom of the screen. The results can be sorted by clicking the column heading, allowing you to easily view the data using different criteria. Also, you can eliminate any data from the results window by double-clicking on the selected items, and the averages at the bottom will automatically be updated. If you have any questions or ideas for future tips, please feel free to give us a call at (800) 541-0803 or email us at admin@omanco.com.